Quiet and comfortable, carpet is a versatile floor covering with several advantages. There are a huge variety of styles and colors available, making it easy to match carpet with any home decor. It adds warmth to a room. 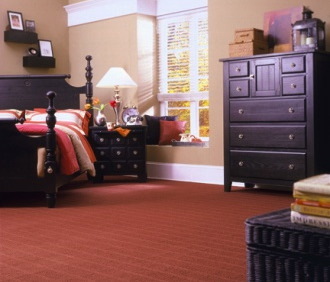 Carpet is now more durable and stain resistant, and it is even softer and more comfortable than in the past. With the vast array of textures, tones, patterns, and styles available, carpet can fit a casual to formal setting. Installation of carpet is easy and economic. It can be installed on any grade level, is much more forgiving of subfloor issues, and is less expensive to install than most hard surface materials. Today's carpet offers much more than a conventional loop pile. To add to a room's sophistication and interest, consider choosing a textured pattern. New technology can produce multilevel loop and cut/loop patterns. Choose diamonds, bows, pin dots, or fleurs-de-lis designs that "pop out" in sculptured effects. The texture, colors, and pattern of the carpet can be made to complement or contrast with patterns of your furniture and window treatments. Using a solid color, textured carpet is a great way to provide interest and pizzazz without going to a multicolor, overall pattern. Smooth, level surfaces; formal atmosphere, "velvet." Smooth, level finish, but pile yarns have more twist so that the yarn ends are visible and create a less formal look. Minimizes foot prints. In this cut pile, the yarns are extremely twisted, forming a "curly" textured surface. This informal look also minimizes foot prints and vacuum marks. Loops are the same height, creating an informal look. It generally lasts a long time in high-traffic areas. Many of today's popular Berber styles are level loop styles with flecks of a darker color on a lighter background. Usually has two to three different loop heights to create pattern effects, providing good durability and a more casual look. Combination of cut and looped yarns. Provides variety of surface textures, including sculptured effects of squares, chevrons, swirls, etc. Fiber is carpet's basic ingredient. The type of fiber used and the way the carpet is constructed determine how well the carpet will stand up to spills, pets, and daily traffic. Approximately 97 percent of all carpet is produced using synthetic fibers that are designed to feature style, easy maintenance, and outstanding value. There are five basic types of carpet pile fibers. Nylon is the most popular fiber and represents two-thirds of the pile fibers used in the United States. Wear-resistant and resilient, it withstands the weight and movement of furniture, and provides brilliant color. It has the structure to conceal and resist soils and stains, and it is generally good for all traffic areas. Also, solution-dyed nylon is color fast because color is added in the fiber production. A strong fiber, olefin resists wear and permanent stains, and is easily cleaned. It is also notably colorfast because color is added during fiber production. It resists static electricity and is often used in both indoor and outdoor installations because of its resistance to moisture and mildew. It is commonly used in synthetic turf for sports surfaces and in the home for patios and game rooms. Many Berbers are made of olefin. Noted for its luxurious, soft "hand" when used in thick, cut-pile textures, polyester has excellent color clarity and retention. It is easily cleaned and is resistant to water-soluble stains. Noted for its luxury and performance, wool is soft, has high bulk, and is available in many colors. A natural fiber, wool is a renewable resource that has some interesting natural properties. It is a thermal insulator, is fire resistant, and is a good air-moisture stabilizer. Generally, wool is somewhat more expensive than synthetic fibers. A wool/nylon blend combines the superior look and comfort of wool with the durability of nylon. Acrylic/olefin and nylon/olefin are other popular blends, offering good characteristics of each fiber. To determine the approximate quantity of carpet you will need, multiply the length (feet) of the room by its width (feet) for the square footage. To obtain the square yardage, divide that figure by 9. Your retainer may figure the amount in square feet or square yards. Add 10 percent to account for room irregularities and pattern match. It is best to have your retailer or installer make final measurements to ensure that you purchase the correct amount. As professionals, they know how to include hallways and closets, match patterns, plan seam placement, work with room irregularities, and account for rooms with widths greater than 12 feet. (Most carpet is produced in 12- and 15-foot widths.) Dealers may sell by the square foot or the square yard. The type of fiber used and the way the carpet is constructed determines the basic performance of the carpet. Quality can be enhanced by the way the fibers, or yarns, are twisted and heat set, and by the density of the tufts. Deep pile height that's densely tufted, has a luxurious feel; however, pile height is really a matter of persoanl choice and does not, in itself, denote durability. Density: refers to the amount of pile yarn in the carpet and the closeness of the tufts. The denser, the better. Twist: is the winding of the yarn around itself. A tighter twist provides enhanced durability. Heat Setting: is the process that sets the twist by heat or steam, enabling yarns to hold their twist over time. Important in cut pile carpet. Most nylon, olefin, and polyester cut pile carpets are heat-set. Performance: Some manufacturers have a rating scale for choosing carpet for various traffic areas - high, moderate or low. Kiser's carries a wide variety of flooring brands. Click below to see them all. Talk to a Kiser's Flooring Specialist Today. We'd love to help with your large projects as well - Businesses, Schools, Churches, Hospitals, Apartments, and more. Contact us about yours today!